Whiskers takes off from Naomi's glove. Photograph by Suzanne Shoemaker. 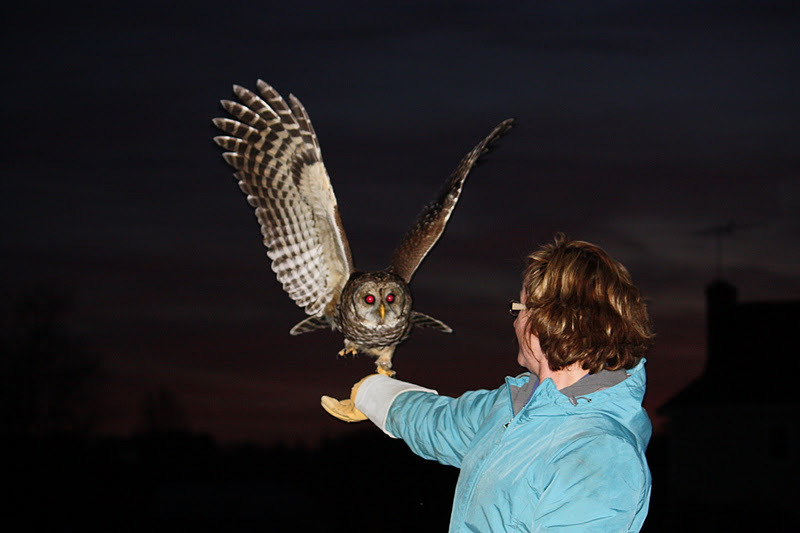 This has been the week of the Cooper’s hawks here at Owl Moon! It began last Wednesday with a call from my falconer friend, Jeff. Jeff is the Special Operations Commander for Charles County, MD Sheriff’s Department. His coworkers know about his interest in birds of prey, so when they got a report about a hawk they sent him to investigate. 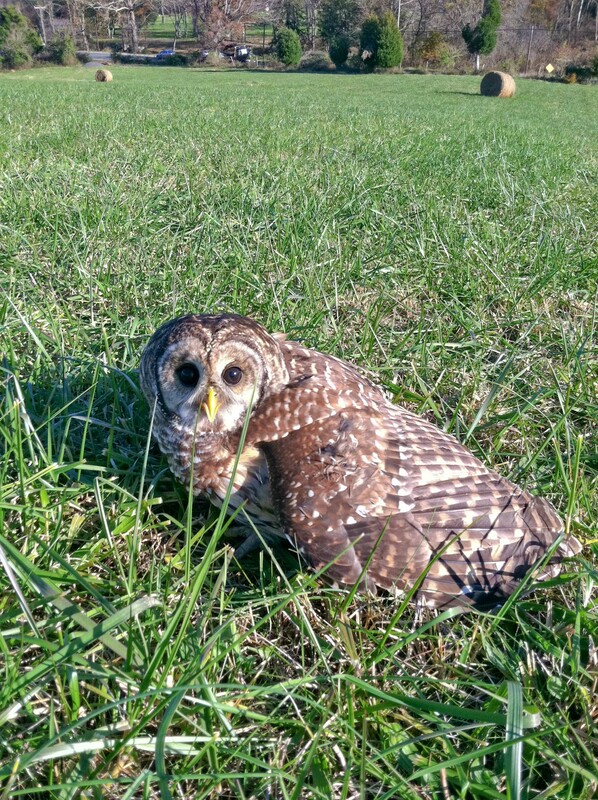 This Coopers, a juvenile male, had been found at the base of a large tree in the yard of a bed & breakfast in Newport, MD. 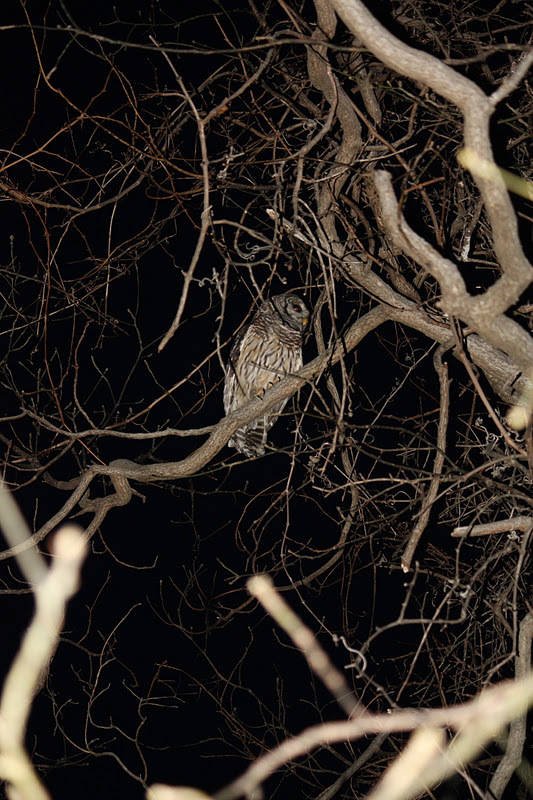 Jeff took him home and provided supportive care overnight, then brought him to Owl Moon the next day. 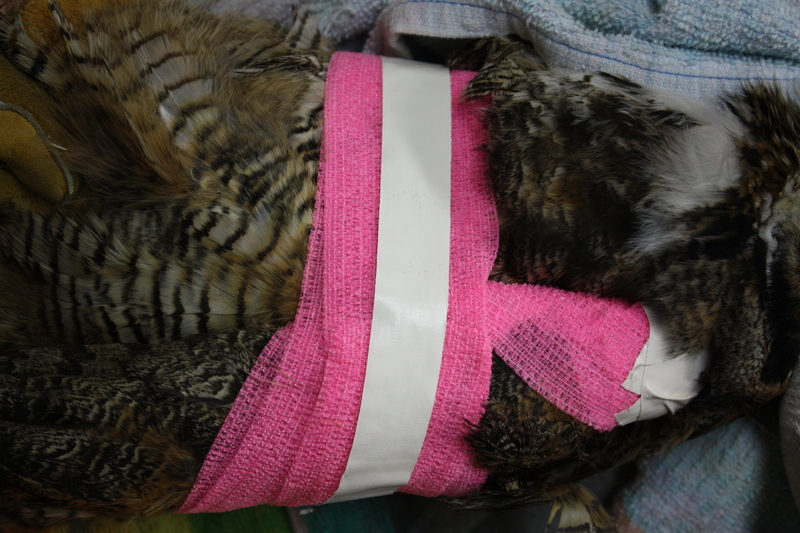 Though not paralyzed, the hawk was unable to stand or fly. 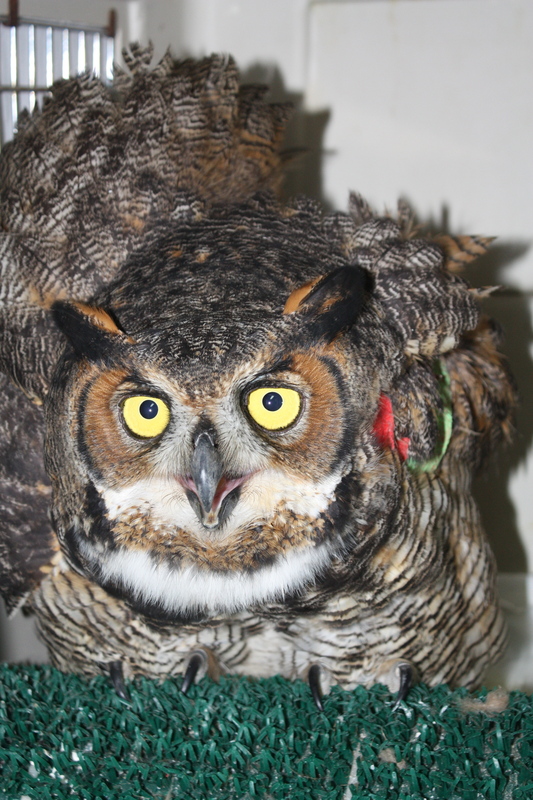 He was disoriented and had head tremors; symptoms which suggest damage to the central nervous system (CNS). There were two possibilities to consider: an impact injury that resulted in head and spinal trauma (such as from flying into a window or being hit by a car), or West Nile Virus, an acute inflammatory virus affecting the CNS. Fortunately, both instances are treated with non-steroidal anti-inflammatory drugs (NSAIDS). We started him on a high dose, along with fluid therapy to combat dehydration. The second call came Friday morning. Chevy Chase Club in Chevy Chase, MD reported that an eagle had flown into the glass of their outdoor ice rink and looked in bad shape. I suspected it was not really an eagle, because eagles are not generally found in urban residential areas, nor are they prone to fly into glass. However, I arrived on the scene with a large kennel, prepared for anything. They had followed my suggestion and placed a box over the bird, to prevent it from escaping before its injuries could be evaluated. When I tipped up the box to peek inside, I saw the skinny legs and long toes and tail of a Cooper’s hawk. This one is a juvenile female, considerably larger than the male. Spooky investigates the camera. Photograph by Suzanne Shoemaker. I am happy to say that “Spooky,” so named because like all Accipiters (the family of true hawks that includes Northern Goshawks, Cooper’s, and Sharp-shinned hawks), she is easily spooked and quick to react, is recovering quickly. We treated her for a few days with NSAIDs, to reduce pain and swelling. Then, to protect her from her own hard-wired instinct to “thrash and crash” in captivity, we moved her to an outside mews. There she can perch up high and have space enough to respect her comfort zone, and thus be safe from self-inflicted injury and feather damage. 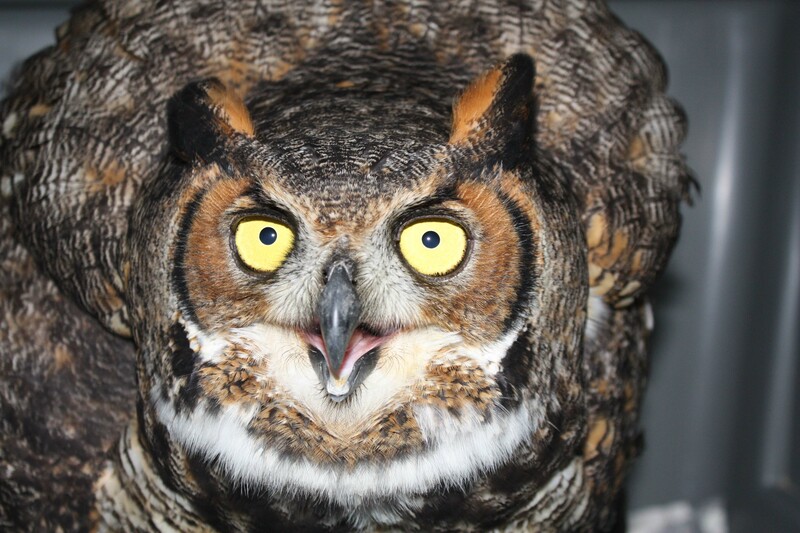 We plan to band and release Spooky this Friday. 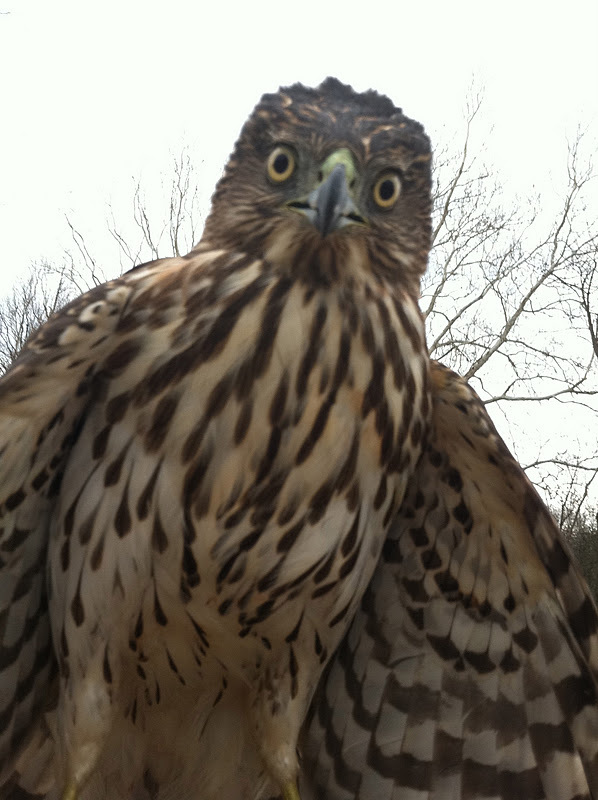 Meanwhile, the juvenile male Cooper’s hawk was not responding to our treatments. He was eating and digesting his food, but he continued to have head tremors and did not regain use of his legs. Sadly, he passed away overnight Friday. The cause of his death will remain a mystery, but I suspect it was a case of West Nile Virus, which in my experience seems to be especially deadly in juvenile Cooper’s hawks. It is always sad to lose a patient; especially knowing the efforts that caring people like Jeff, have invested to save them. Fortunately, Saturday had a bright side as well. 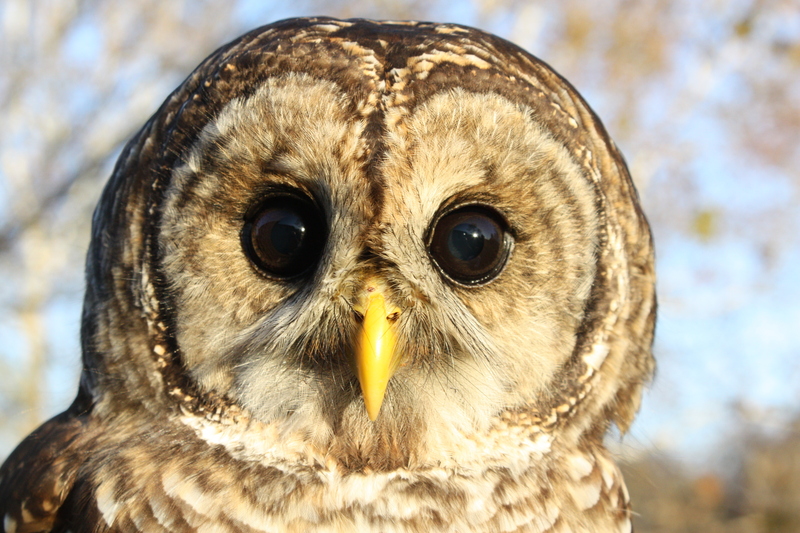 It was release day for our juvenile barred owl “Whiskers.” Whiskers was found in Upper Marlboro, MD, a good distance from Owl Moon Raptor Center. Along the way I stopped at my bird-banding friend, Ken’s, house to band her. He ended up coming along for the release, which was fortunate because on route I got a call from my friend and fellow rehabber, Lee, asking if I could pick up an injured hawk that had been found in Piney Point, MD (even further away). Naomi, the woman who rescued Whisker’s, met us at the intersection where she had found her a month earlier. Naomi was pleased to accept the honor of releasing her. It was dusk, and Whiskers flew into a nearby tree where she surveyed her surroundings long enough for a few photographs before flying off into the sunset. Meanwhile, Lee had been busy on the phone. 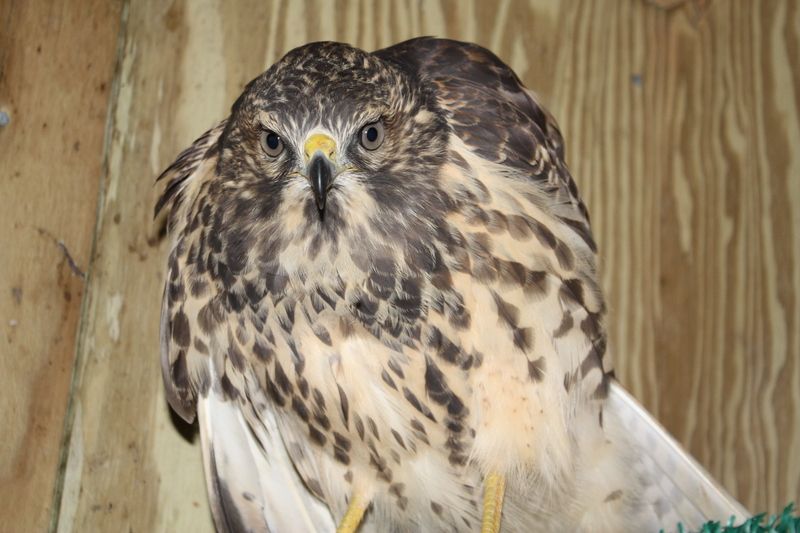 She called MD Department of Natural Resources (DNR), whose Officer Dyson was kind enough to pick up the injured hawk at the Merchant Marines Barracks in Piney Point and transport it to a rendezvous point closer to Upper Marlboro. This saved us a good deal of time and gasoline. When we met Officer Dyson we saw he had brought us yet another juvenile Cooper’s hawk; a soaking wet female. This lucky little lady, whom Ken dubbed “Wet Coops,” had been fished out of the Potomac River by Merchant Marines. Concerned about hypothermia, Ken sat with her wrapped in a towel next to the car’s heater, to get her feathers dried out, as we drove back in the direction of home. 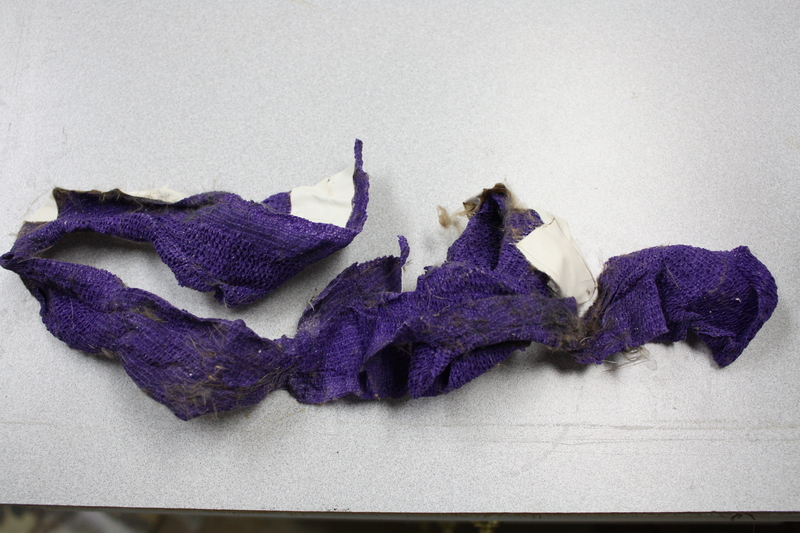 Like Spooky, Wet Coops was probably injured by an impact, as she too has some soft tissue injury of her right wing. Wet Coops was also dehydrated and painfully emaciated, which requires fluid therapy and careful reintroduction to solid food. I am pleased to report that after three days, she has reached that point where we can breathe easier. She is stronger and self-feeding, back on a normal diet, and behaving like a typical Coops! Happy Thanksgiving from Owl Moon! I personally would like to thank Jeff, Naomi, Ken, Lee, and officer Dyson, as well as the folks at the Chevy Chase Club, Merchant Marines, and people like them who go out of their way to help injured wildlife. 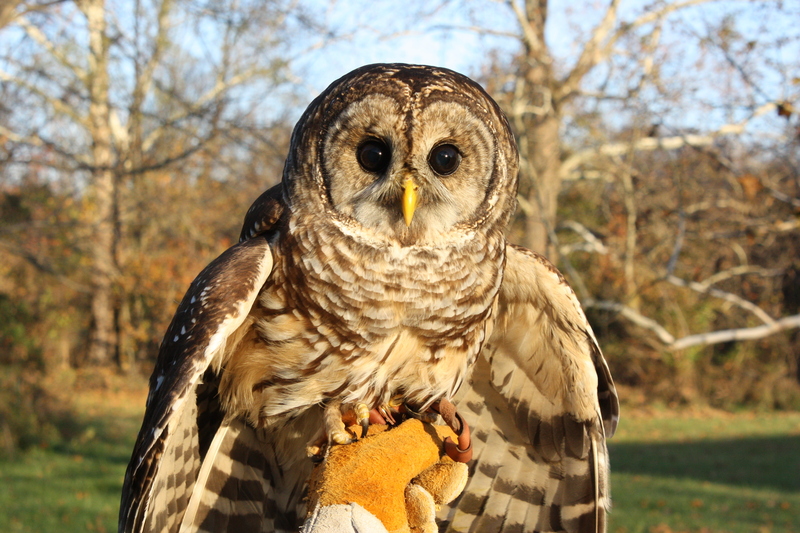 It makes a difference to birds like Whiskers, who will spend this holiday flying free in her native woods thanks to their kindness. Whiskers investigates her surroundings after release. Photograph by Suzanne Shoemaker.